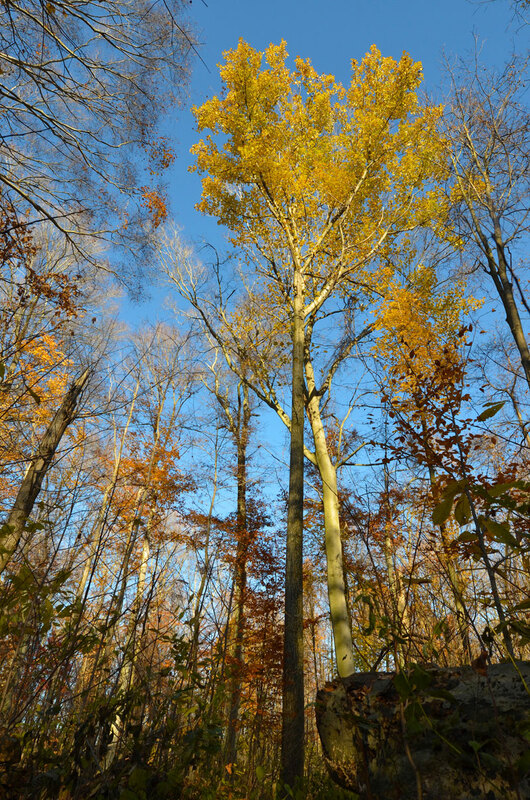 ...fall color at Fort Ancient was hanging on, but just barely! 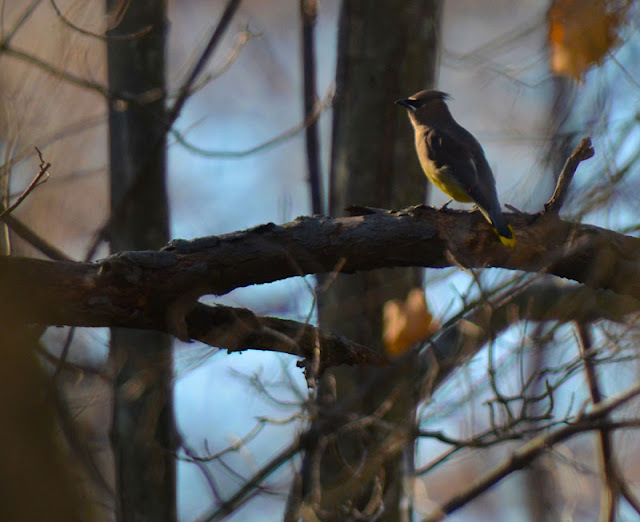 ...a small flock of Cedar Waxwings greeted me where the forest and meadow meet along the Mound Trail. I watched them as they flew from tree to tree, chatting with each other and looking exceptionally dapper in the crisp autumn air. 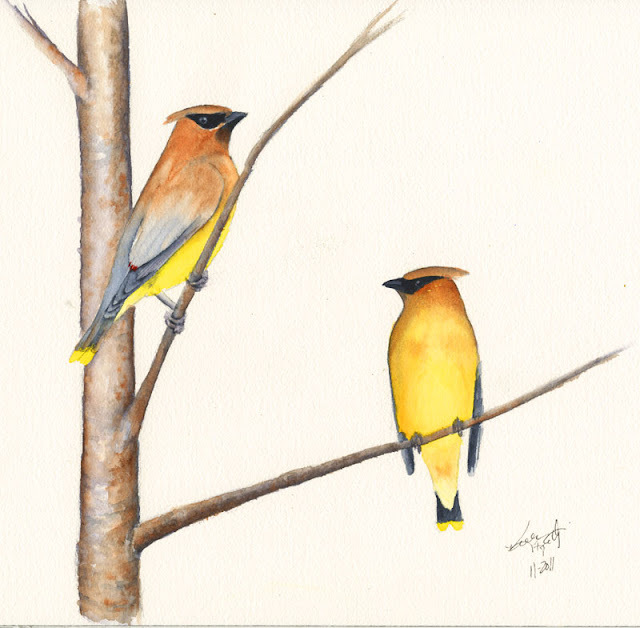 ...I created a few drawings in my sketchbook to remember the encounter, and when I got home, used them to do a quick watercolor, accentuating the yellow in their bellies in anticipation of a jumble of autumn color in the background, but when I showed this version to Rick, he said he wanted the painting as is! He liked the intense color and simple composition (so it will be hanging in his office soon...such a nice husband!). Work in progress! I just started this watercolor painting, so there's lots of work yet to be done. It shows a common sight for us—Cedar Waxwings in the mulberry trees in our backyard. We anticipate their arrival the last couple weeks of May through the first couple weeks of June. It doesn't take them long to decimate the berry crop! Very pretty. I like the different and applied approaches you and your painting brings to the birding community. Taking pictures made me focus so much more on detail; I can only imagine that's exponentially more the case when you're sketching and painting. Very nice Kelly. 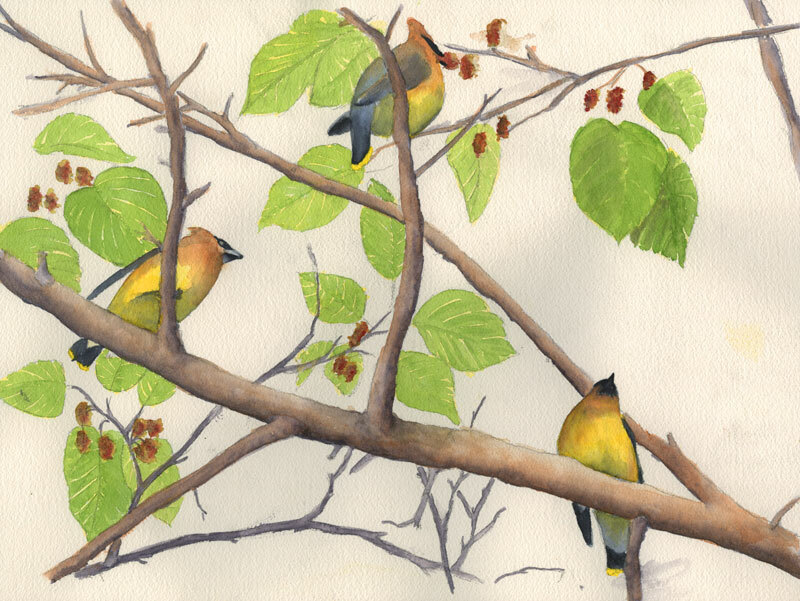 I love seeing the different ways/styles you approach capturing the birds on canvas. Beautiful work Kelly! I too like the simple water color of the Waxwings. Quite nice, Kelly!! I'd like to see a picture of the sketches you made, too. That's always my favorite! Wow, Kelly! Your work is spectacular! You are a very gifted artist. 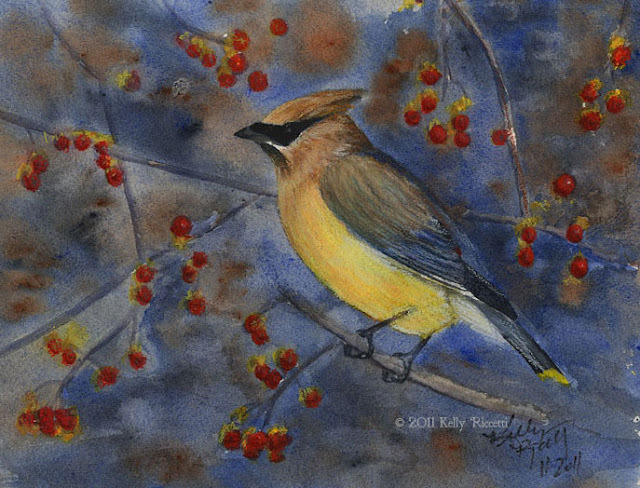 Cedar Waxwings are such striking birds and you have captured them beautifully in your art work. I'm especially fond of the simplicity in the first sketch/watercolor. Wonderful post! Wonderful series, Kelly! I love the one with the bittersweet berries. Those berries must not taste that good because they are usually the last ones eaten in winter. Laurence and maria...Painting birds does help me study them. I pay attention to details and their movements more than I used to. KaHolly...next time I'll include my sketches! Julie...not gifted, but I love birds and put my heart into them. Rick loves the simplicity of that painting too. Hilke....when I saw them eating the bittersweet it was late winter and there were no other berries around! So you're probably right!